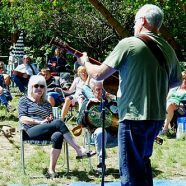 I was asked to teach a couple of workshops on songwriting a few years back at some of my all-time favorite California bluegrass festivals, including the CBA Father’s Day Festival in Grass Valley, Bluegrassin’ in the Foothills in Plymouth and the Mid-state Bluegrass Festival in Paso Robles. In preparation for those workshops, I put together the following notes that I thought might be useful to ponder and chat about, sitting in the grass in the shade of tall trees. Nothing like an acoustic guitar, kindred friends / musicians / songwriters and a shady spot to stretch out on a warm summer day. What inspires you to want to write a song? What do you want to say that’s unique? Expressive? Thoughtful? The memorability test: Is the melody one that you can hum or whistle? This really helped. Right now I’m working on a song to help me deal with a problem I had with a really special girl. I couldn’t figure out how to express it. But now, I feel like it will be alot easier. Thank you! Stop thinking about writing songs, and start writing songs. You really want to be a famous star, don’t you? You daydream about being on stage and hearing the roar of the crowd. Only trouble is, gee whiz, you’re dreaming your life away. If you want to write a really good song, you’re going to have to work for it. Start today. Commit to writing a certain number of songs per week, the way successful authors commit to writing a thousand words a day. I am writing a original in Japanese called,”Biginingu abu za Endo,” and I found you post helpsful! Thankyou! Thanks Mayu. Happy you find the site helpful. Good luck with your new song. Let us know where we can have a listen!